The meter pedestal shall be made entirely of stainless steel, using welded construction and finishing. Pedestals shall be covered by polyester TGIC powder coating having a minimum thickness of 2.5 mils. Top cover shall be a side swing style that locks out for safety. The swing top will open 180 degrees to provide clear access to meter socket and test blocks. The swing top shall be supported by two heavy duty stainless steel hinges with 3/8” pins and that are “lift off” style allowing the top to be completely removed. The Swing top shall also have hemmed edges to eliminate sharp edges. A replaceable 3/16” thick lexan window for viewing shall be installed for meter reading. Lexan window shall be hinged and available with hasps to lock out for safety. The meter socket and test block section shall be equipped with rainwater drainage channel and overlapping equipment panels to ensure watertight design. The meter socket compartment shall house EUSERC approved commercial meter socket and test blocks. The meter section shall accept ring style meter and meter face be attached to meter socket so meter face panel may not be removed without disconnecting meter bulb. Meter section must be padlockable for safety as well as utility seal. The Utility landing section shall be the rear with a removeable panel for full access to landing lugs. Landing lugs shall be aluminum type lugs using hexagon screws for tightening. A cover panel that will accommo- date a padlock and utility seal shall be provided. The customer section will be in the lower front of the pedestal. The compartment shall be fitted with a fully welded door with hemmed edges to eliminate sharp edges. The door design shall use a T-handle latching system to ensure a watertight seal and vandal resistance. A continuous piano hinge shall be used and installed using carriage bolts. This compartment will house a GE load center with main breaker. the internal housing will be fitted with a protective panel and shall only expose the breaker switches. 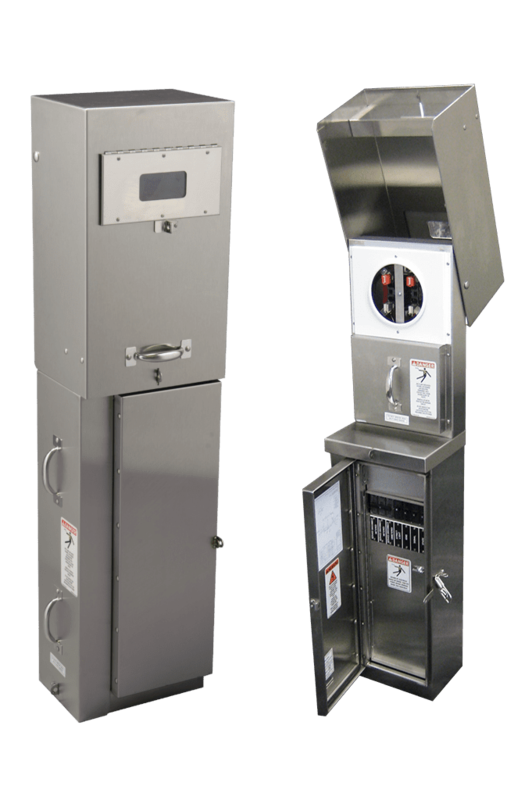 The meter pedestal assemblies shall be 0-200Amp, single phase only 120V/240V rated. The encl sure shall comply with EUSERC electrical standards and current NEC codes. 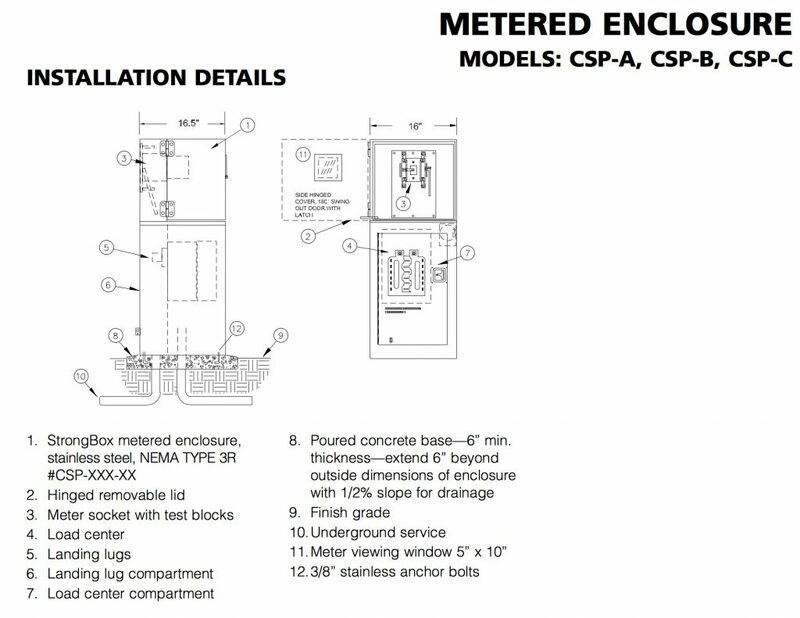 The enclosure shall be rated NEMA TYPE 3R rain- proof and be listed by Underwriter Laboratories, Inc.